Played for Canada’s National Women’s Team in the two-game December Series against the United States in Sarnia, Ont., and Plymouth, Mich., in December 2016 … Won a silver medal with Canada’s National Women’s Team at the 2016 4 Nations Cup in Vierumäki, Finland … Won a silver medal with Canada’s National Women’s Team at the 2016 IIHF Women’s World Championship in Kamloops, B.C. … Won a silver medal with Canada’s National Women’s Team at the 2015 4 Nations Cup in Sundsvall, Sweden … Won a silver medal with Canada’s National Women’s Team at the 2015 IIHF Women’s World Championship in Malmö, Sweden … Won a gold medal with Canada’s National Women’s Team at the 2014 4 Nations Cup in Kamloops, B.C. … Attended Canada’s National Women’s Team Fall Festival in Calgary, Alta., in September 2014 … Won a gold medal with Canada’s National Women’s Team at the 2014 Olympic Winter Games in Sochi, Russia … Played in a six-game series vs. the United States leading up to the 2014 Olympic Winter Games … Won a silver medal with Canada’s National Women’s Team at the 2013 IIHF Women’s World Championship in Ottawa, Ont. 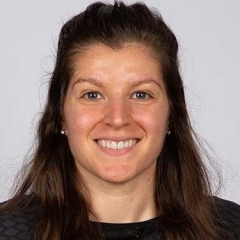 … Was a member of Canada’s National Women’s Under-22/Development Team for a three-game series against the United States in in Calgary, Alta., in August 2012 … Won a gold medal with Canada’s National Women’s Team at the 2012 IIHF Women’s World Championship in Burlington, Vt. … Won a silver medal with Canada’s National Women’s Team at the 2011 4 Nations Cup in Nyköping, Sweden … Attended Canada’s National Women’s Team September Camp/Fall Festival in Calgary, Alta., in September 2011 … Attended Canada’s National Women’s Under-22/Development Team training camp in Rockland, Ont., in August 2011 … Attended Canada’s National Women’s Team selection camp in Toronto, Ont., in April 2011 … Won a gold medal with Canada’s National Women’s Under-22 Team at the 2011 MLP Cup in Kreuzlingen, Switzerland … Attended Canada’s National Women’s Team evaluation camp in Calgary, Alta., in September 2010 … Was a member of Canada’s National Women’s Under-22 Team for a three-game series vs. the United States in Toronto, Ont., in August 2010 … Won a gold medal with Canada’s National Women’s Under-22 Team at the 2010 MLP Cup in Ravensburg, Germany … Was a member of Canada’s National Women’s Under-22 Team for a three-game series vs. Canada’s National Women’s Team in Calgary, Alta., in August 2009 … Won a silver medal with Canada’s National Women’s Under-18 Team at the 2009 IIHF World Women’s U18 Championship in Füssen, Germany … Was a member of Canada’s National Women’s Under-18 Team for a three-game series against the United States in Lake Placid, N.Y., in August 2008 … Won a silver medal with Canada’s National Women’s Under-18 Team at the 2008 IIHF World Women’s U18 Championship in Calgary, Alta.